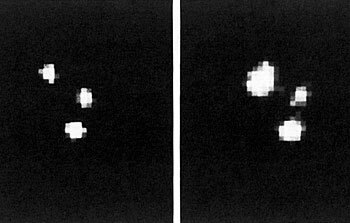 8 December 1988: Reinhold Häfner, visiting astronomer at the ESO La Silla Observatory, got his life's surprise when the star on the screen in front of him suddenly was gone. All the other stars were still visible, but this particular one had simply vanished. 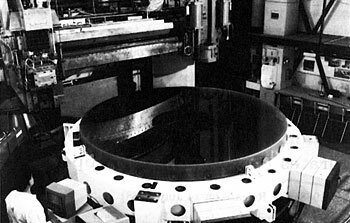 12 September 1988: After a period of intense negotiation, the European Southern Observatory and Schott Glaswerke, Mainz (F.R.Germany) reached agreement about the delivery of four giant mirror blanks for the ESO Very Large Telescope (VLT) (ESO8716). The blanks will be made of Zerodur, a glass ceramic material. Each will have a diameter of 8.2 metres, an area of more than 50 square metres and a thickness of only 17.5 centimetres. 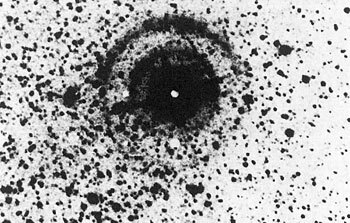 9 September 1988: The most distant, individual star ever recorded was detected with a telescope at the ESO La Silla observatory on August 9, 1988. The object is an exploding star, a supernova, and is situated in an inconspicuous galaxy, itself a member of a distant cluster of galaxies. Additional observations indicate that the cluster, known as AC118, is at a distance of about 5 billion light-years (1 billion = 1000 million). Thus this supernova explosion occurred 5 billion years ago, or about the time when the Sun and the planets were born. Ever since then, the light emitted by this event has been travelling towards us, only arriving here now. It is the most distant supernova (ESO8802) observed so far. 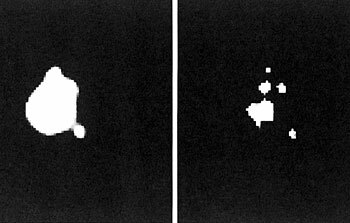 28 July 1988: Thanks to observations performed under near-perfect conditions at the La Silla observatory, it has been possible to show that the image of a distant quasar consists of no less than four components. Most appropriately, the object has now become known as the cloverleaf quasar. 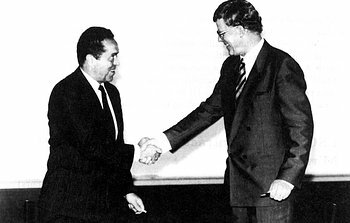 The peculiar image is due to the effect of "gravitational lensing", a phenomenon predicted by Einstein's General Theory of Relativity and explained at the end of this Press Release. 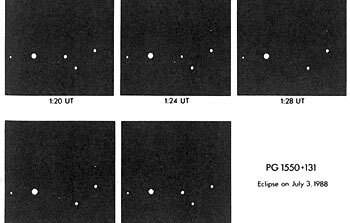 14 July 1988: On the occasion of the successful completion of the optical figuring of the 3.58 m primary NTT mirror, the European Southern Observatory and Carl Zeiss, FRG, organize a Press Conference on Wednesday, July 13, 14.00 hours, at the Zeiss works in Oberkochen, near Stuttgart, FRG. 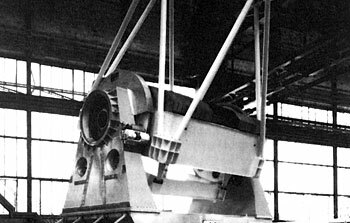 There will be an opportunity to see the finished mirror on its computer controlled support system and information will be provided about the successful tests of the world's first, large active optics telescope. 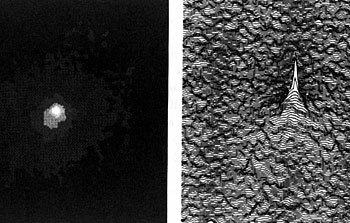 8 July 1988: A unique picture of Comet Halley has just been obtained by three astronomers with a telescope at the ESO La Silla observatory. An exposure time of almost 12 hours was necessary to show the structure of the famous comet in some detail at the present, very large distance of 1250 million kilometres. 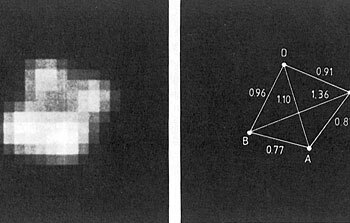 19 May 1988: The most massive stars may be less heavy than thought before. Recent observations with two telescopes at the ESO La Silla observatory have now shown that a star in the Large Magellanic Cloud, long believed to be one of the most massive in existence, is in fact multiple and consists of a very compact cluster of hot, young stars. This discovery may have important implications for the theory of stellar birth and the determination of distances in the Universe. 9 February 1988: Last week, M/S “Cervo" arrived in the harbour of Valparaiso, Chile, with the packaged parts for the building which will house the ESO New Technology Telescope (NTT). Soon thereafter, the 350 ton load was hauled by road to the ESO La Silla observatory in the Atacama desert, some 600 km north of Santiago de Chile. Here, at one of the best astronomical sites on earth, the giant mechanical puzzle will now be put together to form one of the strangest telescope domes ever seen. The 3.5 m New Technology Telescope is the forerunner of the ESO Very Large Telescope (VLT) (see eso8602 and eso8717). When the NTT is ready later this year, it will be the technologically most advanced telescope in the world.